GRAND EAST NASHVILLE HOME just 3 miles from Downtown! As you arrive in Historic East Nashville & first set eyes on this Grand Nashville Residence, just 3 miles from the heart of downtown Nashville, you’ll feel in awe of this modern, well-appointed vacation home. Just up the pathway past the white picket fence you’ll enter through the doorway into an open-airy grand floor plan. This home is so spacious and laid out perfectly for large groups to gather and socialize. Then head off in the evening to private rooms with plush,comfy beds. The lower level features a massive kitchen, living area with plenty of plush seating, and large dining area. Each space also opens directly out to the AMAZING Back Deck which boasts outdoor dining for 12, a lounge area, gas grill and HOT TUB! There are also 3 Sleeping Areas on the 1st floor; a 2nd Master Suite with King Bed and Full Bath, a Private Den with doors for privacy with a comfy plush daybed and trundle (2 twin beds) and the loving area with a high-end queen sleeper sofa. Heading upstairs you will arrive in the Upstairs Club Room with large comfy sectional couch and queen sleeper sofa. Each upstairs bedroom is accessed from the Club Room; including 2 queen bedrooms that share a large 4-piece bath with double vanity, and lastly, the Grand Master Suite, with a king bed, desk area and spa-like 4-piece bath. 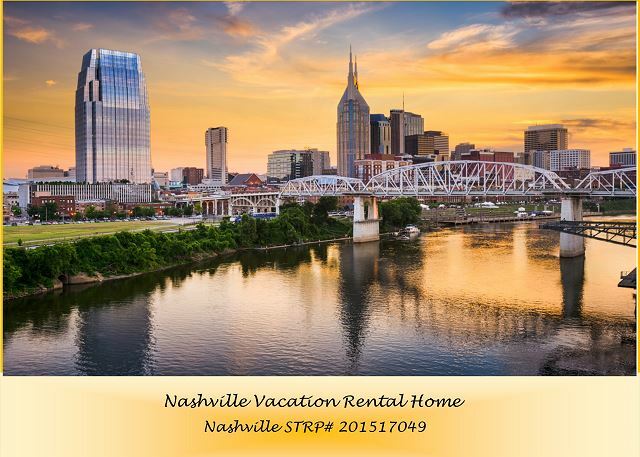 Playlist Properties was the first 100% locally owned and operated licensed Vacation Rental Management Company in Nashville. When you call us, you are talking to a Nashville local! This place was absolutely beautiful and as described. It was great for 4 couples and you still have room to sleep plenty more people. There is also a working hot tub at this place. Only negative is the water pressure was really low in the main bathroom in particular. I felt like you couldn't get soap off you. Had to bring in a plastic cup to help rinse off. Loved the kitchen; shocked they had a crockpot. The deck area was really nice as well. Their was a Kroger food/beer store down the street you could walk to. Downtown was a 15 minute Uber/Lyft ride. We didn't have a problem getting a ride in this city. We enjoy Party Fowl restaurant for some famous chicken. Hattie B's was crowded and local Lyft driver recommended. So good. Martin's BBQ was also a great place to eat. We went right from the airport to The Pharmacy for lunch since we couldnt get into this property til later. We had so much fun on the Pedal Tour; our guide was great and so was the music he played. Johnny Cash musuem was also good. Highly recommend this place. It was awesome.Plenty of room and bathrooms. Bedrooms were nice and private. Very handy to the downtown. East Nashville was also fun. Manager Response: Mike, thank you for your review! We are so glad that you enjoyed your stay with Playlist Properties. East Nashville is a great area with access to plenty of dining, bars and a short distance to downtown Nashville. Music City Scene is a great property for a large group. We look forward to your next visit to Nashville. It was a good experience. The house was beautiful but the coffee machine was broken(I send an email thru the App and no answer), there was no salt and pepper, not enough pots and pans for cooking. There were 7 of us that stayed at the music city scene property and we had a wonderful time. The property was spacious and beautiful. We had an issue with the dryer not working and the management company had a competent person come over and fix it in 30 minutes. We were thoroughly impressed with the quick response and professionalism of both the management company and the maintenance repair man. Also, we were very grateful to see the pristine care that was given to the hot tub. It was super clean and was cleaned and serviced daily! I would highly recommend this property and this management group. I had invited my friends to Nashville for a reunion and needed a house large enough for everyone, and Music City Scene was perfect for us. The area was quiet but close to restaurants, coffee shops, and close to downtown so that we didn't spend all our time driving. The management company was so helpful and made sure we had everything we needed. I will definitely choose Music City Scene again for my future visitors. Fantastic, it went perfectly for the 10 of us! Manager Response: Thank your for the 5 star recommendation! Belated Happy Birthday to your wife! Glad we were able to provide comfortable, and enjoyable accommodations for the occasion. I have visited Nashville for over 13 years and this property by far has out done all the rest. Beautiful. What a wonderful meeting and vacation stop got our extended family. We were 11 of us ranging from 2 years old to 65. The house layout, sleeping , entertaining, outdoor area and location were exceptional. We enjoyed a true family Thanksgiving and some great family time!!! This house was amazing! A group of 10, stayed with plenty of room to be together or apart. The house was clean and well kept. I know some of the reviews I read on HomeAway site mentioned an odor, and we did notice it but it faded within the first 5 mins. Our biggest complaint was in the day of check out a gentlemen began power washing the fence and deck at 8am. Not especially pleasant given the fact that we payed for late check out and many of us did not go to bed till 5am.